Agents of S.H.I.E.L.D. is BACK! Three months after the last episode and the unnerving mid-season finale, we're finally getting to see what happens next. What went down this past Tuesday night? Let's find out. Spoilers! Agents of S.H.I.E.L.D. contains PG-13 level violence. The episode begins with a scene three months from now... in space. We see a spaceship; the camera pans backwards to show us blood droplets, a canister, and a gold cross necklace suspended in midair. We then see someone’s shoulder with a S.H.I.E.L.D. patch on it before the spaceship explodes. In present day Colombia, the police respond to a fire but are attacked by an unseen assailant who whips their weapons right out of their hands. The guns in the back of their truck are stolen by a mysterious girl... who is wearing a gold cross necklace. Back in America, Coulson looks at the bloodstains left behind by Rosalind’s death. (Ouch.) May asks why Coulson chose Rosalind’s apartment as a meeting spot, and Coulson gives a couple of reasons before THE PRESIDENT walks in. (Yes, the same actor as in Iron Man 3. The continuity is awesome.) The two of them exchange pleasantries before getting down to business. The situation with Inhumans is escalating, especially in the political realm, and the President insists they have to do something. Coulson says they are. In Colombia, Joey and Daisy go undercover at the police station to investigate. While waiting in the lobby, they discuss Joey’s family and how his mom cooks for him on Sundays. (So cute.) Before Daisy can explain her awkward family situation, they’re approached by Colonel Ramon. Daisy explains that they’re following up on the stolen guns report, which were stolen by an Inhuman. Ramon is baffled and a bit scared by the Inhumans, but Daisy assures him they’re here to help. The President tells Coulson that he’s not publicly reauthorizing S.H.I.E.L.D., but he needs Coulson to privately keep doing what he’s doing. He says the ATCU will still appear to be how the President responds to advanced threats (like aliens and superhumans), but the future director of the ATCU will actually answer to Coulson. S.H.I.E.L.D. will become a black-ops response, operating behind the scenes and in the shadows. Coulson then asks the President if he knows anything about Gideon Malick, but the President says Malick’s too powerful and refuses to get involved. May apologizes that the President didn’t give Coulson any help, but Coulson hints that he may actually have. The three of them fan out to investigate more, and Mack runs into the mysterious Inhuman from the beginning of the episode, who steals his gun before he can react. She then knocks him out and puts him in the back of her truck. He wakes up taped to a sink and sees his captor talking to someone else, but she shuts the door on him before he can get any info. Back at base, Hunter, Bobbi, and Daisy examine security footage of Mack and find that he was attacked by... a blur. Daisy is impressed. They realize that they’re dealing with a super fast superhuman and start a plan to catch her. This includes Jemma remotely adjusting the containment module to adapt to this Inhuman’s powers. The module adapts in other situations too, since, in her words, Inhumans’ powers are so random. Lincoln objects to this, saying that he was taught powers were given to fulfill an evolutionary need at the time--an actual intelligent design. Coulson snaps at Fitz to come with him on a walk down the hall and asks him what he thinks of Lincoln. Fitz says he’s helpful in figuring out Inhuman biology, and it’s a good distraction for Jemma after what happened to Will. Fitz feels guilty about what he did, but Coulson reassures him that he did what he had to do. 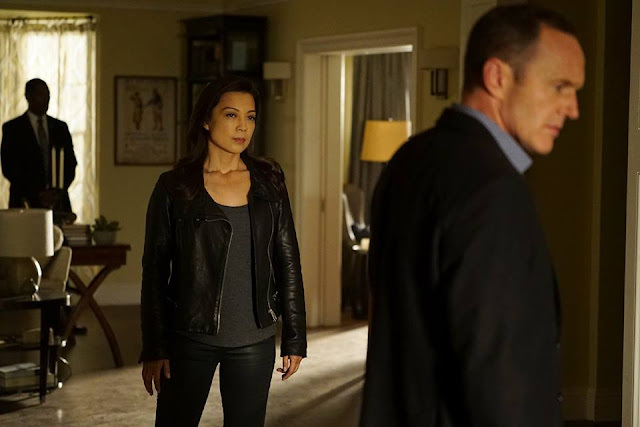 Coulson takes Fitz into a secret room and tells him to set up the mind-reading machine so he can get inside the head of the one person who may have information on Gideon Malick. In Colombia, Mack has managed to free himself and battles Invisible Girl, but she ends up coming out on top and pulling a gun on him. Back on base, Coulson has them bring Von Strucker--who’s in a vegetative state--to the mind-reading machine so he can get closer to Malick. Speaking of Malick, he and his new right-hand-man Giyera discuss needing Inhumans for “their guest,” who is barely able to stand or speak. Once the elevator opens, Malick is notified that he is wanted by their guest. Malick walks into a room where, in a satisfyingly creepy and well-done scene, Dead!Ward announces he’s hungry. Mack has been upgraded to being tied to a chair. He and his captor actually manage to talk despite the language barrier. She insists she’s not a criminal and wouldn’t use her powers--gifts from God--to do bad things. Mack explains that the powers came from pescados (fish) and that she’s an alien. As if summoned by this conversation, Daisy appears on the scene, complete with an earth-shaking, door-breaking entrance. She’s accompanied by Bobbi and Hunter. They’re relieved to see Mack, and they’ve locked Really Fast Girl in the room and knocked her out. The team prepares for Really Fast Girl to wake up, and they dig deeper into her past and personal life. Her name is Elena Rodriguez (a last name fans of the Secret Warriors comic story line may recognize). They locate her accomplice, her cousin, and Hunter and Bobbi leave to go track him and the weapons down. As they leave, Elena wakes up and “blurs” back and forth in her cell. Joey tries to talk to her, but she’s not easily calmed. Dead!Ward eats some food (hopefully not human), and he and Giyera have a bonding moment over not being human. But the moment quickly turns sinister as Dead!Ward detects that Giyera is skeptical about what how powerful he is. Dead!Ward assures him that once he’s strong enough, he will. Back in Von Strucker’s own personal hell, he’s still begging them to kill him because he’s stuck in a traumatic memory. Despite Lincoln’s initial reluctance, Lincoln uses his electricity to provide a jolt to his brain in order to get him out of the traumatic memory loop. Coulson asks how to reach Malick, and Von Strucker flashes back to a process that involves a shop and secret code words (“Perizad sent me. We went to Princeton together”), which is apparently all Coulson needed. Joey tries to convince Elena that they’re safe people. Elena elaborates and says that God gave her these powers to end injustice instead of accepting the way things have always been. They confront her about the weapons and asks what she’s going to use them for, but she says they’re not going to USE them. Speaking of the weapons, Hunter and Bobbi have located Elena’s accomplice, who dumps the guns in a lake and surrenders. Elena says they’re making sure no one else can use the weapons. Daisy argues that they were for the police, but Elena insists that the police are thieves in uniform and are only powerful because they have guns. She wants to protect her friends from the police, but she’s not happy that the agents of S.H.I.E.L.D. are trying to stop her. Bobbi calls Daisy and confirms that Elena’s telling the truth. Ramon from the police station shows up on the scene, and Bobbi tries to bluff her way out of it but ends up grabbing her batons to fight. Before she can, Ramon’s buddy lifts his glasses up and zaps her with his eyes. Her skin becomes discolored, and she pretty much passes out. He does the same to Hunter and Elena’s cousin... but then he shoots her cousin in the head to send a message. Later that night, Mack, Joey, and Daisy have recovered the body. Daisy calls Coulson, and Joey and Mack speculate that the police probably had an Inhuman with them. Elena’s been asking about her cousin, so Mack lets her out of the containment module and shows her the body, apologizing for her loss. She’s devastated. At the police station, Bobbi and Hunter wake up, still semi-frozen and in pain. Ramon and his Inhuman buddy walk in, and the latter zaps Hunter with his eyes again to freeze him. Ramon says that Hunter’s fate depends on the answers Bobbi gives to his questions. He asks why she’s there. Daisy, Joey, and Mack approach Elena at her brother’s bedside. With Joey as a translator, Mack explains that he, too, relies on his faith like Elena. He says maybe their powers aren’t random--maybe it’s all part of a plan. Elena says she has a duty to use her powers to do better, and Mack says they should work together to do so. Elena agrees, and Daisy asks how her powers work. Elena says it’s connected to her pulse--as far as she can go in one heartbeat. With Elena, the agents go on a mission to rescue Bobbi and Hunter. Elena retrieves an ID badge from a police officer without them noticing, and Daisy proclaims that Elena is her new best friend. Mack, aka the Best Director, makes a plan to invade the police station, giving Elena a magical cuff to contain the Inhuman. They all break in and spread out with Joey taking care of the police’s weapons and Daisy going after Bobbi and Hunter. Elena accompanies Daisy, and they work together with their individual powers to defeat the bad guys. It’s honestly beautiful. 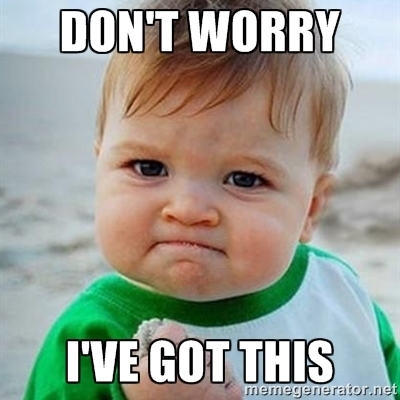 Joey melts the police’s guns and reconvenes with Daisy and Elena in a crowded room. Before Daisy can even formulate a plan, Elena has already stolen all the police officers’ weapons and incapacitated them. Mack finds Bobbi’s room and delivers a huge punch to Ramon, but Bobbi tells him to warn the others. Mack says over the radio that the Inhuman’s power is in his eyes, but Elena doesn’t listen and instead lunges for him with the magic cuff. He zaps her, and she lands on the ground incapacitated. Joey melds the metal glasses to the Inhuman’s face, and Daisy knocks him out with a shockwave. Coulson finds the shop Von Strucker referenced and delivers the code words to the man up front. (Is his job to just sit there for hours waiting for people who want to meet with Gideon Malick? What a sad life.) Coulson is frisked with a metal detector and thus forced to remove his metal prosthetic. He’s lead through to a room with a phone in it, which he places a tracer on before picking up. He is put on hold with elevator music. (It’s hilarious.) 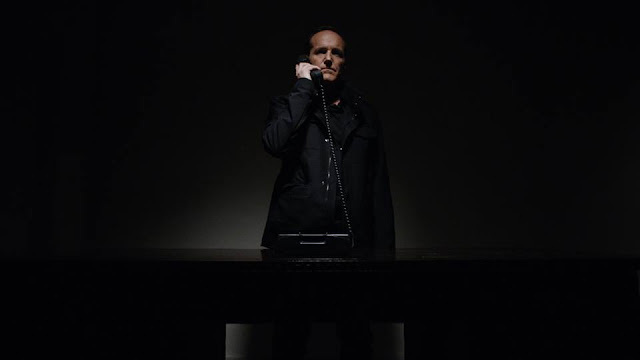 Malick picks up a few seconds later, and Coulson threatens him, telling him that they’re tracing the phone to everywhere it connects. Malick isn’t scared and tells Coulson as much before hanging up. Elena is okay, and she insists she needs to stay in Colombia rather than go with S.H.I.E.L.D. Daisy and Mack watch Joey talk to her and discuss it between themselves, agreeing that Elena is a perfect fit for Daisy’s team. Mack says it would be better to keep Elena close--safer. But Daisy disagrees, saying it makes them more vulnerable like the twelve Inhumans killed by Lash. She says that when she was a hacker, she was close to her team even though they didn’t live on the same continent. Mack thinks that maybe that could work. Daisy says she’ll pitch it to the Director. 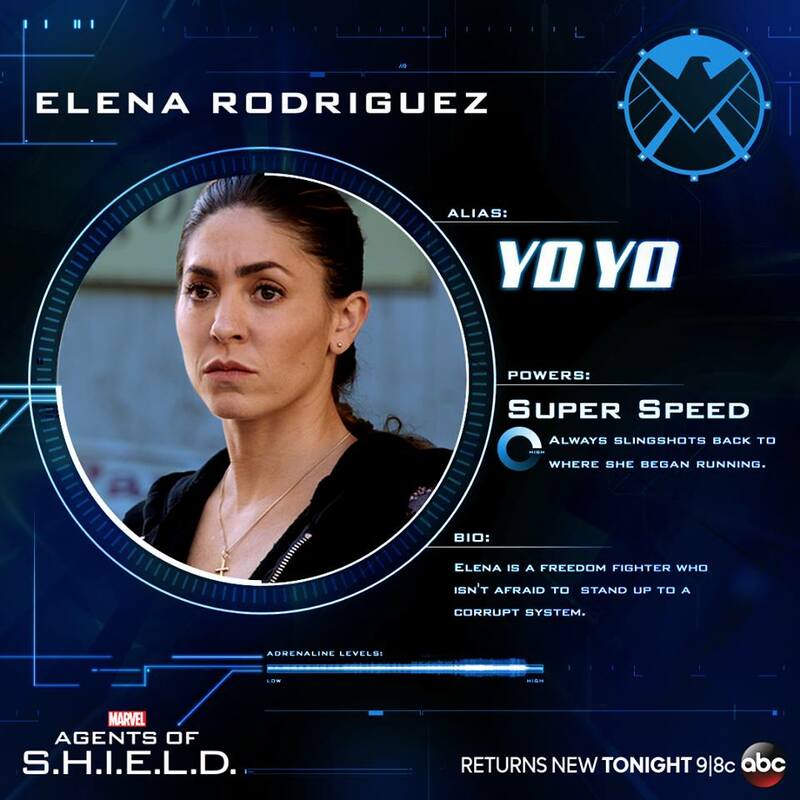 YoYo Rodriguez is a member of the original Secret Warriors in the comics. 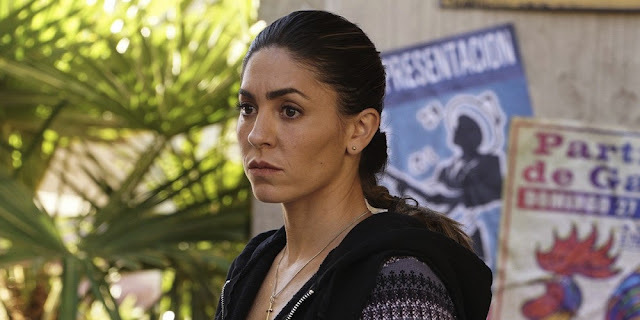 She’s another kickass female, she's Latina, she's driven by her faith, and I’m so excited to have her join AOS. As Elena leaves, Daisy says maybe Joey doesn’t have to miss dinner this Sunday. In the lab, Fitzsimmons blunder through an awkward conversation before Jemma just blurts out that she misses Fitz. She brings up the things they’ve been avoiding--Will’s death, their kiss. Fitz apologizes, saying maybe there was something else he could have done to save Will. Jemma says that Will died saving Jemma, so what Fitz did was kill a monster. (Kind of, considering the monster isn’t dead) They agree to start over where they began. They introduce themselves to each other, shake hands, and then fist bump (and I’m crying). Lincoln finds Daisy, and they discuss how Joey’s leaving to go back home. Daisy worries that she’s making a mistake--not by letting Joey go but by letting Lincoln go free if he wants, too. Lincoln says he’d rather stay, and they share a kiss. In the post-credits scene, the President and Coulson have a Skype call where it’s revealed that Talbot is the new head of the ATCU, much to Coulson’s dismay. This was a solid mid-season premiere filled with plenty of quips, intrigue, and confusion to keep me going. Dead!Ward's new role as the supervillain Hive is already off to a good and creepy start, and I'm looking forward to seeing where that goes. As you already know, I'm thrilled at the inclusion of Elena, and this episode had some really good moments involving faith and the possibility of a master plan. I'm not sure what that master plan is or what's going to happen going forward, but I'm definitely intrigued. I also had all the feels when Fitzsimmons reconciled--I'm glad we get a clean slate after all the junk they went through last season. Overall, our characters have gone through a lot, but they're moving forward and learning to heal, and that's amazing to see. This probably won't last long, but whatever. Have you seen "Bouncing Back"? What do you think of it? What are your theories as to what will happen? Let's discuss in the comments!